Marinette County is a county located in the state of Wisconsin. Based on the 2010 census, the population was 41,749. Its county seat is Marinette, which now includes the former independent village of Menekaunee as a neighborhood. Marinette County is part of the Marinette, WIâ€“MI Micropolitan Statistical Area. Marinette was christened Marguerite Chevallier but later through some quirk came to be known by the then popular "nickname" of "Marinette," the diminutive for Marie Antoinette, Queen of France, whose tragic death at the time of the French Revolution, caused much excitement among the French settlers in this territory. The French and Indians on the river when pronouncing "Marie Antoinette" would shorten the name by pronouncing it "Marinette." Holding our Marguerite in high esteem they resorted to calling her "Queen Marinette," queen of their adopted country, thus the origin of the name. Marinette took it title from the village which was named for Marinette Chevalier (1793-1865), a French Chippewa metis, wife of John B. Jacobs, and later of William Farnsworth; the last-named settled on this site in 1822. There had previously been here a trading-post of the American Fur Company, and it continued as a trade center for many years, largely unded the direction of Marinette, who had much business ability. The town was platted by her son, John B. Jacobs. The name is an abbreviation of Marie Antoinette Marinette-contraction of Marie Antoinette, name of semi-civilized Indian chief. 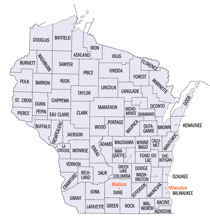 In February 1851, Oconto County separated from Brown County, and held the distinction of being the largest county in Wisconsin until it was divided to half its original size by act of the Wisconsin Legislature, March 3, 1879, when Marinette County was formed. Marinette County is named after "Queen" Marinette, a 19th Century trading post owner who was the daughter of a Menominee princess and a French-Canadian trapper. 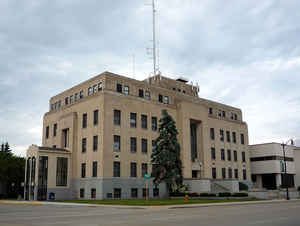 Located in northeast Wisconsin, the county seat is Marinette. As reported by the Census Bureau, the county has a total area of 1,550 square miles (4,015 km2), of which, 1,402 square miles (3,631 km2) of it is land and 148 square miles (384 km2) of it (9.57%) is water.